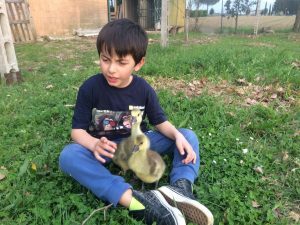 In Italy there is a saying, “Christmas is for family and Easter is for friends.” For the Menards it is not always easy to distinguish between the two. Everyday is Christmas and everyone is family. Arriving to Perugia airport after a very uncomfortable (but friendly) RyanAir flight we were instantly on home ground. The sights, the sounds the smells – all very familiar and very comfortable. The beautiful, lush, green farmland, the birds singing overhead, the scent of spring mingling with freshly mowed grass. It’s a short drive to the house and we are exhausted after a 4:30am wake up call. Peace and quiet and a comfortable bed are calling to us. We pull up to the house and immediately Chiara pops out to welcome us home. We unpack quickly and drive to Bevagna for our traditional welcome to Umbria lunch with Simone and Desiderio at le Delizie del Borgo. Spring has arrived – in the form of a bowl of tagliatelle with fresh artichokes. 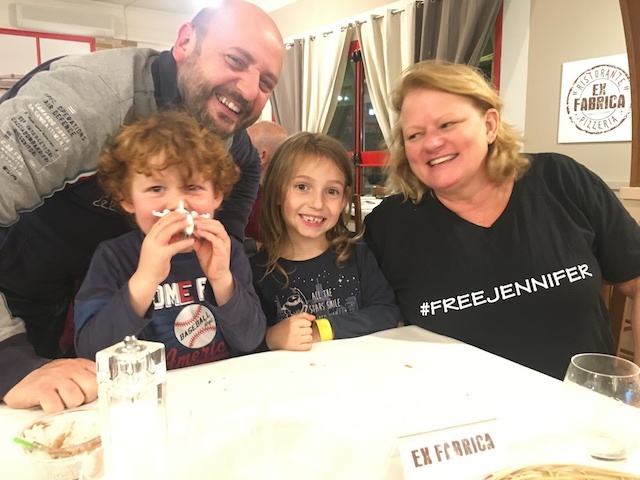 After a long – much needed nap – we walk into town to have a glass of wine with Federico Bibi and his children Olivia and Gabrielle. We promise them that their mother is just days away from returning home after running our kitchen at Via Umbria in DC. 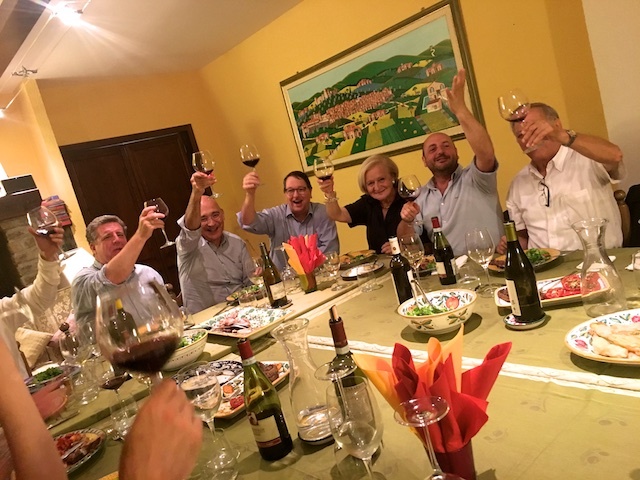 And finally we walk the Bibi family home and stop in Per Bacco for a quick dinner with Ernesto and Simona – a quick dinner is soon forgotten as the evening turns into sharing story after story and grappa after grappa. 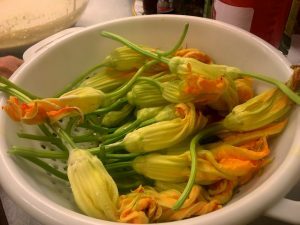 Everyone here shares our love and passion for Umbria. They have grown up here and choose to raise their families here. There is a magic in the air and they want everyone to know it. They have all joined us in Washington to share their love of Umbria. 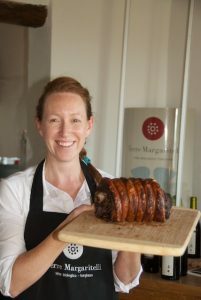 Coming to cook dinners for our guests, to teach us about wines, to explore the history of jacquard linens in Umbria and of cashmere. 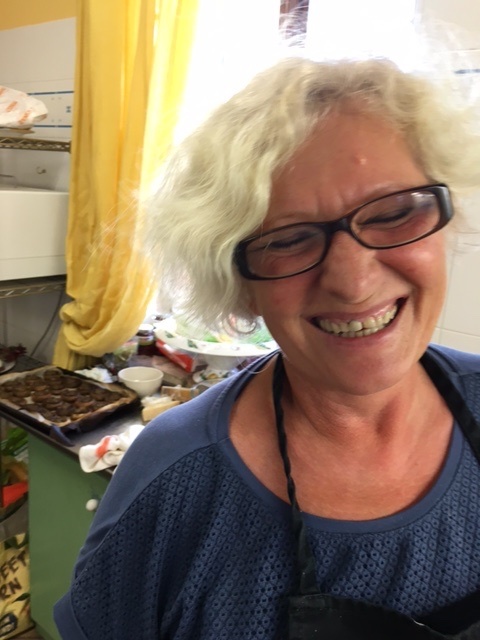 This is a community who works with their hands – at the end of the day it’s not about a stack of papers or an empty mailbox – it’s about plants growing in the garden, freshly baked bread, wine opened and served at just the right moment, scarves (did I say scarves? ), tablecloths, sweaters and hats from the highest quality linen and cashmere. It’s the blending of the old and the new. We all have the same dream and work together to make sure that Umbria is preserved and shared. 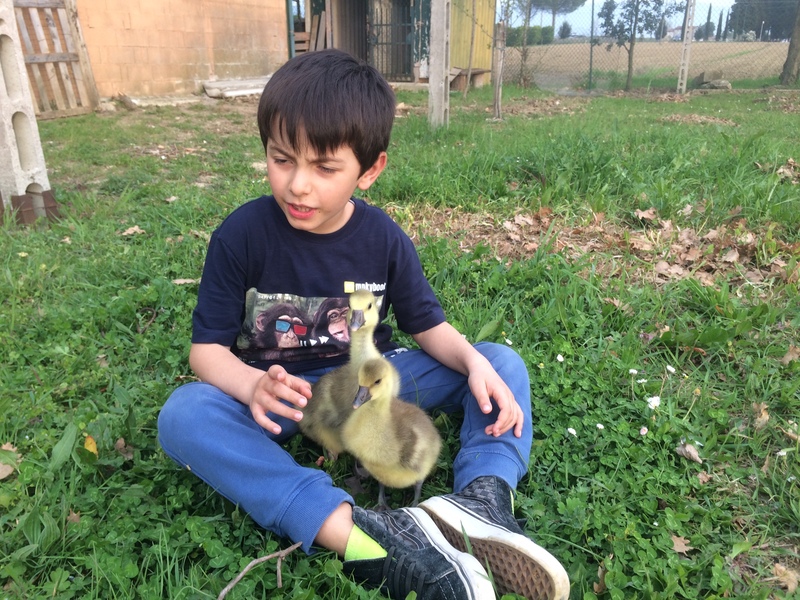 We couldn’t do what we do without the support of our friends (now family) in Umbria. For us, every moment is a teachable moment; an opportunity to learn about what we are seeing and doing; to meet new people and discover new ideas; a moment to stop and reflect on what is happening. This week we will live every moment to the fullest. Here in Cannara we will be introducing our group to our family in Italy. 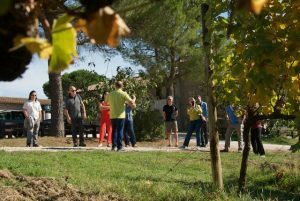 We will be drinking local wines, cooking traditional food, discovering the area and most of all learning together and laughing together. Enjoying every moment. And in Washington at Via Umbria we will be introducing guests to our family in the states. We will be drinking Umbrian wines, cooking Umbrian food, discovering imported products from Umbria and most of all learning together and laughing together. Enjoying every moment. Thank you to everyone who believes in our dream and works so hard to ensure that everyday is Christmas and everyone is family. Download your free ticket by clicking on the image. And be sure to forward it to all your friends! Tuesday night you can show your support for our friends and neighbors in central Italy that were devastated by last month’s powerful earthquake. 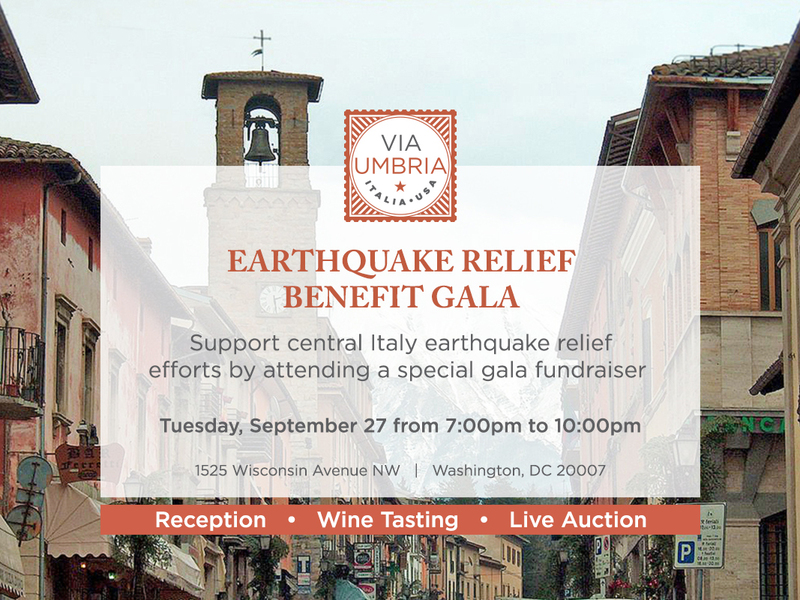 Via Umbria is hosting a benefit gala and auction to raise funds for relief and rebuilding efforts. 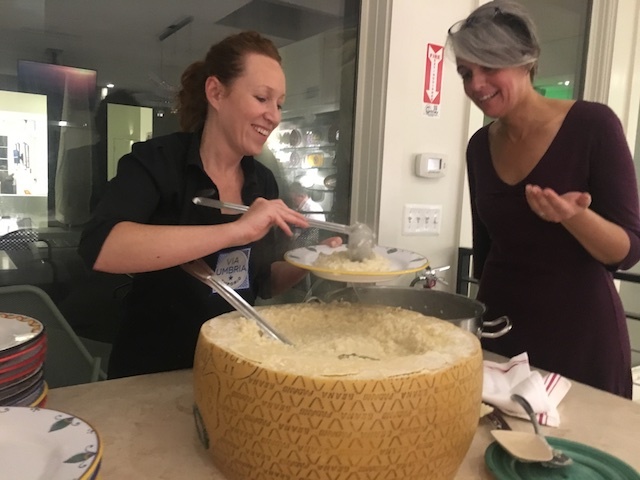 There will be tons of food donated by and showcasing a number of local chefs, Italian wines and a silent and live auction of some pretty fabulous items, including a week at our Umbrian farmhouse (and a hot air balloon ride and champagne brunch), restaurant gift certificates, artwork, jewelry and more! Admission is free, but we’re hoping most will make a donation (suggested level is $100 but we’ll take any donation). We really are hoping to see a lot of people who love Italy and want to show their support for the victims in Amatrice, Accumoli and the other villages that face years of rebuilding. So plan to come out on Tuesday night (7:00-10:00), bring your checkbook and let’s have some fun (and food and wine)! You can download your ticket here. Please RSVP by clicking on the link. And please, please, PLEASE forward the ticket to as many friends as you can, personally urging them to attend to show their support. Suzy and I are looking forward to seeing you tomorrow (Tuesday) night! Mother Nature — a term that is such a complete contradiction. Nature, the most powerful force in the universe is indifferent to those it impacts. When nature provides us its bounty – sustenance, panoramic vistas, long, rich, rewarding lives – we marvel at its power and project benign intentions to it, honoring nature as we would our mothers. When it shows us its awesomeness but spares us the impact – a distant lightning storm or an erupting volcano – we stand in awe of it. But those powerful forces can also be arbitrary, random and deadly. And when they are unleashed against us or count us as innocent bystanders, we simply tuck away those experiences in a compartment, refusing to challenge our notions of a benign “mother nature” and see it as a “one off” phenomenon. Nature neither loves us or hates us. It simply is. A week ago, in the early morning hours of August 24, the people of central Italy, including our friends and neighbors in Umbria, the other place we call home, were awakened by the terror of what the Italians call a terremoto. A magnitude 6.2 earthquake leveled buildings, buried under rubble hundreds of inhabitants that had no chance to escape their homes and obliterated whole villages. In the week since the earth shook, the death toll has climbed above two hundred and those left homeless and hopeless has reached the thousands. Early reports placed the epicenter of the quake near Norcia, a town known throughout Italy as the capital of cured meats, the place where pork butchery was invented and where early medieval surgeons were trained and sent out into the world. Like many of the other towns making the news, Norcia is a place with which we are intimately familiar, for it is literally in our back yard. Those reports also mentioned Perugia and other towns that make up our Italian world, but the real destruction was felt further south, along the border between Umbria and Lazio, an ancient region originally populated by the Sabines. We are familiar, too with this area, which though rarely visited by tourists is a place we have traversed and explored often. It is a rugged, sparsely populated area dotted with small, rough, isolated villages. Many of those villages, happily existing alone and cut off from the modern world have been decimated, their remoteness and isolation making rescue and recovery operations that much more difficult. The impact on our property and our orbit was minimal. Guests staying at our farmhouse in the village of Cannara reported no damage or injury, although the movement of the ground, a side to side rather than up and down motion, apparently sloshed a great deal of water from our pool. 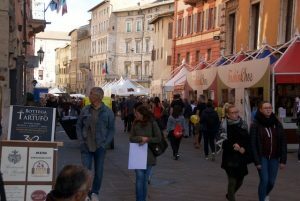 Thankfully our friends and acquaintances who hail from the other nearby ancient towns that dot this region – Perugia, Deruta, Montefalco, Bevagna, Spoleto – came through relatively unscathed. Not so the inhabitants from Amatrice and the neighboring town of Accumoli. The devastation there was so great it led the mayor to exclaim “half the town no longer exists.” Images of the destruction are gut wrenching, collapsed buildings covered in a thin monochromatic gray coating of dust, looking like the setting of a post-apocalyptic film. The rebuilding and recovery efforts have already started but experience tells us the work will never truly be done. Worse than the death and destruction of properties and historic landmarks, if there is such a thing as worse in this regard, is the complete devastation of the social fabric that holds people together, that gives their lives purpose and meaning, that defines their lives as theirs. Suzy and I have witnessed firsthand this complete wiping away of the social structure, this destruction of lives and a way of life. 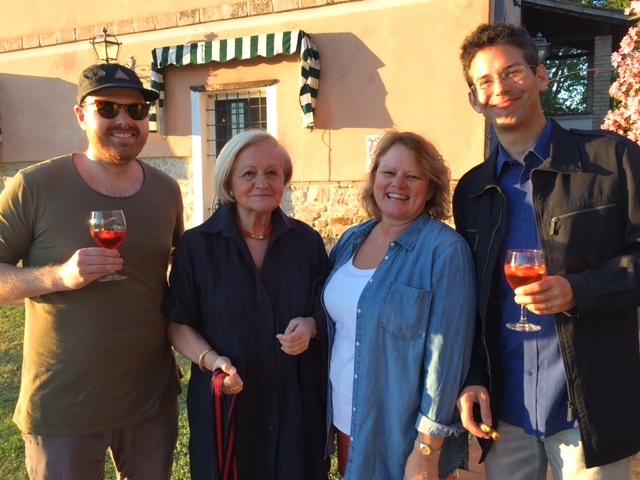 We did so several years ago when we visited a friend in l’Aquila, the site of the last major earthquake in Italy. There we saw a town that was more maintaining itself than rebuilding itself, its buildings standing but empty, like a Hollywood set. Even though a couple of years had passed since the big quake, life there was different, with a palpably gaping emptiness, a hollowness in the routines of life brought about not by the terror of being shaken awake in the middle of the night or having to deal with the death of neighbors and family, but rather by the loss of place and routine – the lively piazzas and the nightly passagiata through the street. Restaurants had reopened, not in the the city centro, but in makeshift FEMA-type trailers that ringed the city. Makeshift attempts to rebuild the past social life that were still makeshift when we visited l’Aquila years later. Attempts that seemed not to be gaining traction. The l’Aquila we visited was as raw, fragile, damaged and hopeless as it had been the day after the quake. A town or a village, we learned then, is much more than just its buildings or just its people. It is the intersection of the two that animates the place and the people and it is that intersection that was shaken and torn and damaged in certain corners of Italy last week. The buildings can be reconstructed or replaced. The victims can be mourned and eulogized. But the survivors must be cared for too, for their lives – not just their immediate surroundings but the entire social network that had previously connected them to something bigger and better and more meaningful than themselves – has been reduced to rubble no less than their homes and places of work have been destroyed. And it is only by feeling its absence that we can truly appreciate the power that this connectedness wields over our lives. Indeed it is this connectedness – to our families, to our communities, to nature and its rhythms, to simple, elegant beauty, to our past, our traditions and our history – that animates our lives. It is the duality of us being individuals and at the same time being part of a whole that in the end defines our lives and gives meaning and purpose to it. Independence and interdependence coexisting and existing in the same space and time. At this moment it is essential that we restore the quake victims’ independence – rebuilding their homes, caring for their injured, and mourning their lost. But restoring their interdependence – rebuilding a social structure that developed organically over centuries in a place and because of the nature of that place, is a much more difficult but no less important part of our work as well. 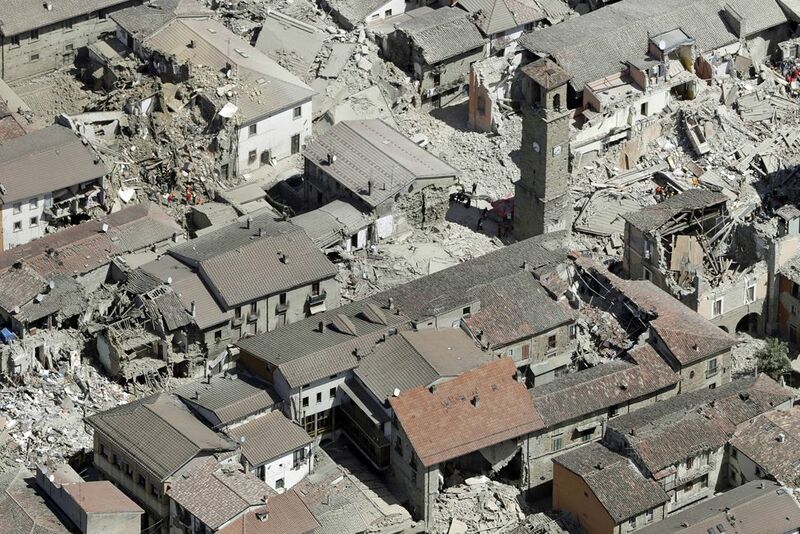 Planning is underway at Via Umbria for a series of events to raise funds for earthquake relief efforts. Please watch this space for further details. We hope you will join us in providing support for relief efforts and funds to assist the residents of this devastated area rebuild the lives and way of life that were literally shaken apart in the middle of the night a week ago. And we hope you will remain afterwards, to help rebuild and support communities that have been no less ruptured than the people. After many days of postponing and rescheduling our trip, we finally made it to the airport, bags in hand, happily seated at our gate, ready for a short but amazing trip to our favorite place only to find out that the flight was delayed. Not just delayed, extremely delayed. By the time we finally (rather crankily) boarded the plane six more hours were gone from our already truncated vacation but we were determined to make the most of it. 6:30pm With our original scheduled arrival time in Rome of 7:24 am we had planned to have lunch with Simone in Bevagna. With the flight delay, however, lunchtime was long gone by the time we left Rome but we beelined for Simone’s anyway (after making a quick stop at Lufra to pick up fresh mozzarella di bufala of course). We arrived at le Delizie del Borgo just in time for Spritz O’Clock and spent an hour catching up with our fourth (and favorite) ‘son’ Simone over a platter of salamis and cheese. 7:30pm When we finally made our way to the Farmhouse, Jennifer McIlvaine and Federico Bibi pulled up behind us with their adorable children, and after a few minutes of excited greetings in the driveway we opted for drinks in the living room. For those of you suffering through the current east coast heatwave you will find it impossible to believe, but despite being the dead of summer, it was way too cold to sit outside! Inside we found Marco and Orusia firing up the pizza oven, and friends of ours from Washington who were staying with us at the Farmhouse soon returned from a day of touring. Not far behind them were our son and his girlfriend whom we picked up at the Foligno train station- the last piece of our group. Marco outdid himself, as always, and our raucous group enjoyed pie after pie with a bit of spicy bomba and Birra Perugia. A small taste of Nutella pizza to end the meal. 12:00am No idea what time it was when bedtime finally rolled around but it was definitely a long day. 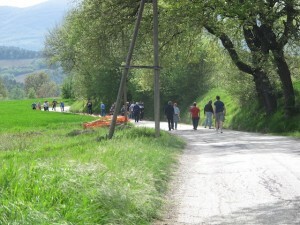 1:00pm After catching up on our zzzzzs our intrepid group headed to Bevagna for a “light” lunch with Simone. It was another beautiful day and we happily enjoyed our meal outside in the park. 5:00pm I finally had to give in and take a quick nap while Bill took a group to Foligno on a hunt for a Sicilian pastry shop to satiate a craving for cassata, and a visit to the Granarium (our nearby zero kilometer granary, mill and bakery) for a tour and to buy flour, bread and cookies. 7:30pm – It’s a birthday celebration and we have invited several (see below) of our Italian friends to join us. We were hoping to eat outside, but again it is too cold and the Italians want nothing to do with the chilly, fresh air. We have Spritz by the pool and then head indoors where Marco has rearranged the dining room to accommodate our small party of 25. 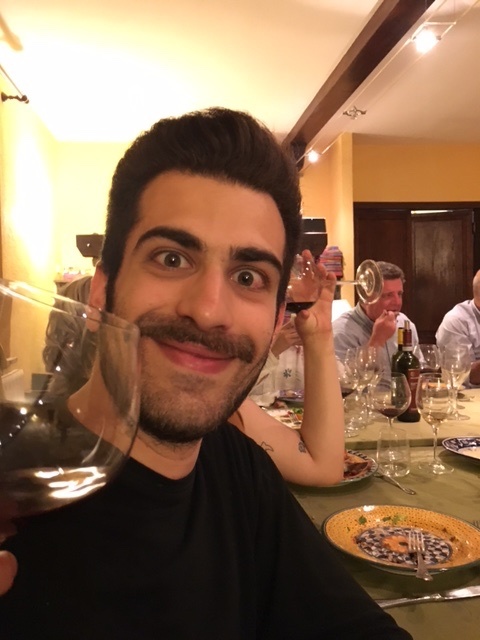 In addition to the group staying with us we are happy to have Gerardo and Assunta Ribigini, Jennifer and Federico (tonight they are senza children), Albertino and Jessica Pardi, Zia Augusta, Alberto, Linda and GianLuca Pardi and Linda’s mother, Federico and Claudia Ribigini and Daniele Sassi. 8:15pm Everyone has brought wine so we have a selection from Terre Margaritelli, Pardi and Tabarrini to pair with a favorite summer meal – fried sage leaves, onions, zucchini and zucchini blossoms followed by pasta with arugula and walnuts, mixed grill and vegetables from the garden. 10:00pm We have sparklers in the Birthday cake but the real fireworks are outside. Marco has picked up a fabulous pyrotechnic display and Bill has it matched perfectly to Whitney Houston’s Star Spangled Banner. 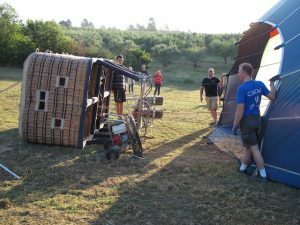 6:00am – early departure to Cantina Dionigi for a Hot Air Balloon Ride. You can read about it here. 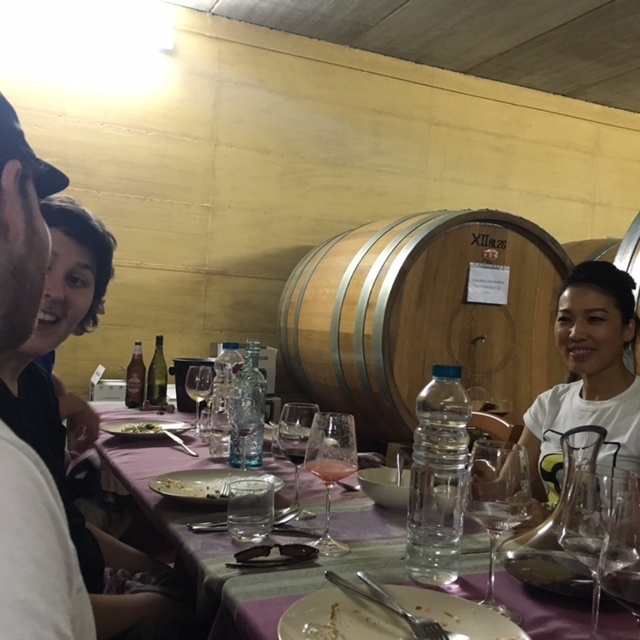 1:00 pm – Lunch in Bevagna with Simone, Marco, Francesco Rustici and his wife Elisa, plus the group at the house. An opportunity to introduce our guests to our favorite Italian Tradition – Sunday Lunch. 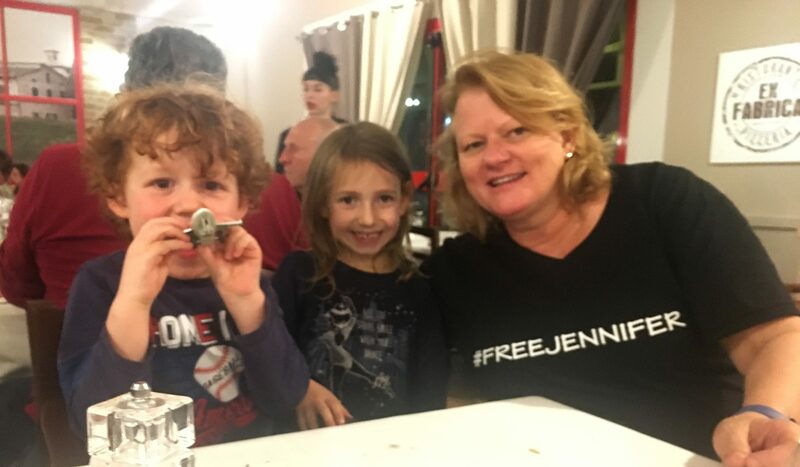 Our children have bravely endured lunches lasting anywhere from 3-7 hours and despite their protests as children they have come to love and expect them. This is a meal where the food is slowly paced, no electronics are on hand and everyone is engaged in conversation. 6:00 pm – Not a Menard record – but still an excellent leisurely lunch. Back to the house with Ombretta’s children Silvia and Tomaso for a quick swim before the sun sets. 7:00pm – Albertino and Jessica stop by to visit and we make plans for dinner on Tuesday night. 8:00pm – All plans of attending a local wine festival get scratched in favor of setting up the big screen outside and picking up pizza. Another chilly night so we bundle up and hunker down to watch a movie. 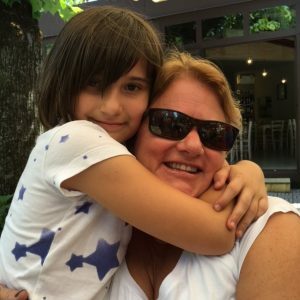 9:00am – Up by 9:00 to play cards with Tomaso and Silvia (who have opted to spend the night) and say goodbye to our guests. 11:00am – The sun is shining and we take a break to sit by the pool and swim with Tomaso and Silvia. 1:00pm – Off to Cantina Tabarrini to see the new renovation – it’s breathtaking. Giampaolo’s plans and ideas are exhausting but the result is going to be amazing. 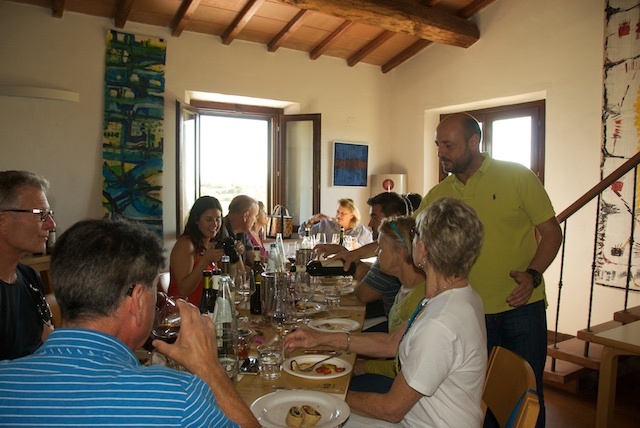 We are treated to an excellent meal prepared by Franca and Federica – food fresh from their garden and an introduction to a new label and the latest release of Montefalco Rosso. 6:00pm – Back to the house for a couple of quick business calls and emails – it’s a work day after all. 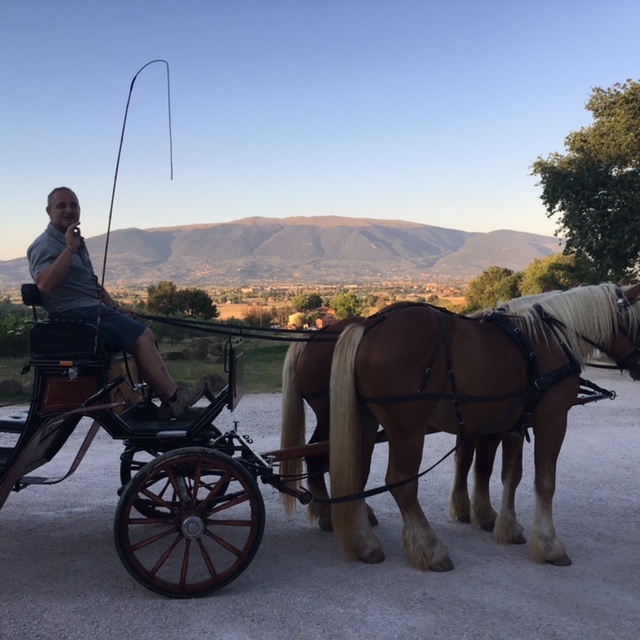 Roberto is just back from his winery in Romania but he has the horses all set up for a sunset carriage ride through the vineyard. 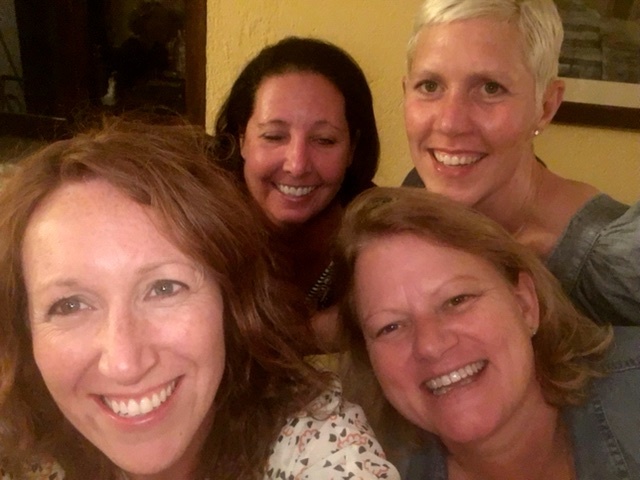 Elena and Bianca Maria are fantastic hosts and we enjoy a flight of Asiago cheeses and plenty of wines. Enjoying a beautiful night with friends with Assisi lit up and sparkling in the distance. 8:00am – Up early to pack and return emails. 1:00pm – Off to lunch at the home of Marco’s parents, Anna and Lodovico Palermi where we are joined by Chiara, Carlo Alberto and Viola and Chiara’s mother Mariella. 3:30pm – Back to the house to Visit with Augusta. 6:00pm – Time to pack up. 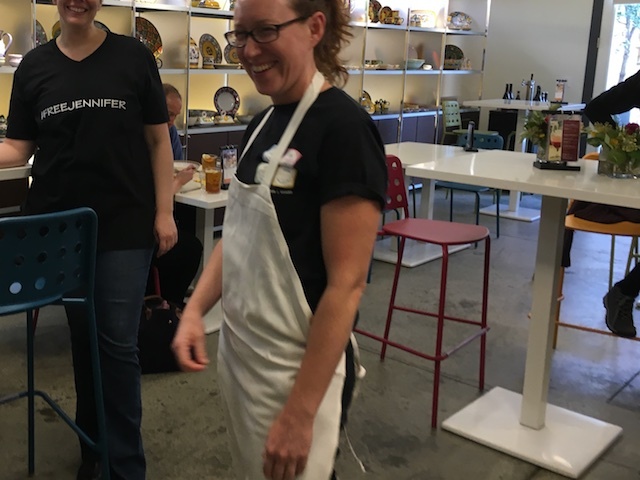 7:00pm – Off to Cantina Pardi for a farewell dinner of Jessica’s Korean specialities. It’s not easy to find all the staples for a Korean feast in the heart of Italy but Jessica makes it all seem simple and delicious. 10:30pm – Quick stop in Bevagna to say goodbye to Simone. The circle is complete. We have seen everyone and enjoyed our brief visit. It’s time to go home and share our experiences, stories and hopefully a few new tastes at Via Umbria. 6:00am – Early morning and departure for Rome FCO and back to DC. Bill gets the honor of captaining the early morning drive. I sleep. 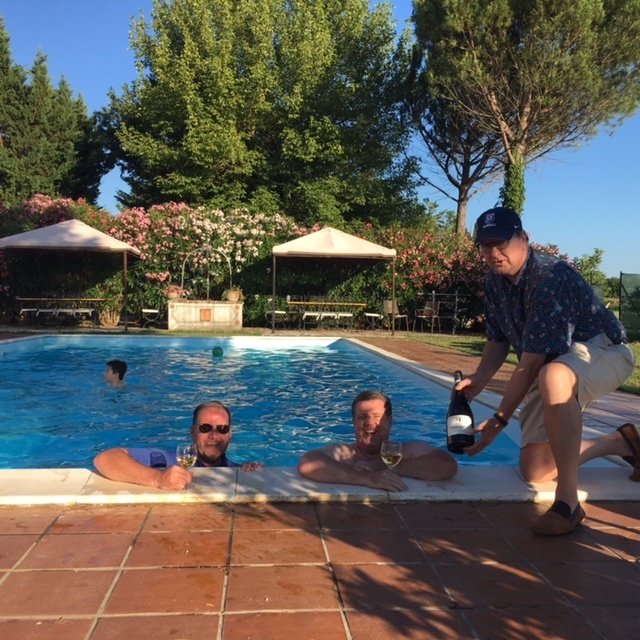 Not the most relaxing summer vacation – but it’s easy to trade in relaxation for good friends, good wine, and good fun. Italy is such a magical place, but the most special thing about it for me has always been the people and it’s trips like these that remind me how lucky I am to have found such a great community in Umbria. For those of you who were not able to come with us on this trip, we encourage you to keep apprised of the goings on in the store. Rumor has it a few of these friendly faces may be popping up in Georgetown in the next few months. And for those of you looking to book your own vacations in Italy, give us a call! We are happy to share our experience, and our farmhouse with you. Early to bed, early to rise is not our typical modus operandi during our visits to Umbria and our Saturday night activity – dinner for 25 in our farmhouse, highlighted by an outdoor fireworks display to celebrate one of our guests’ birthdays – did not presage well our ability to rise early for our Sunday activity. But rise early we did. Both from bed and from the ground. Arriving at the Cantina Dionigi at 6:24am, a full minute before the drop dead deadline of 6:25, we were greeted warmly by our good friend Roberto Dionigi, one of the family owners of this venerable Montefalco winery. We were also introduced to Eleonora Lolli, marketing director for Balloon Adventures Italy, Umbria’s new hot air balloon tour company. 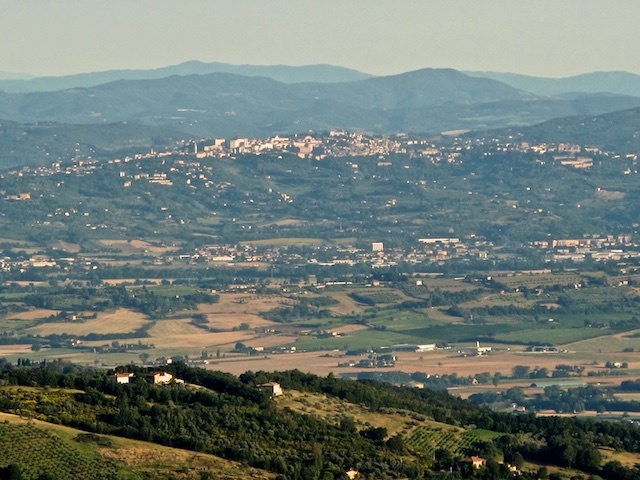 In just a short while we would slip the surly bonds of earth and float peacefully above the val d’umbria. 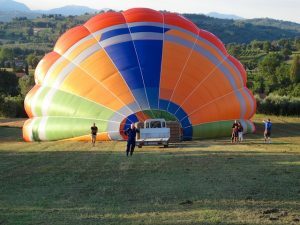 Balloon Adventures Italy is owned, operated and piloted by Peter Kollar, a recent emigrant to Umbria who had the good fortune to purchase a property next door to the Cantina Dionigi. Peter chose the property because it featured a good sized open, flat piece of land ideal for launching and landing his 18 passenger balloon. 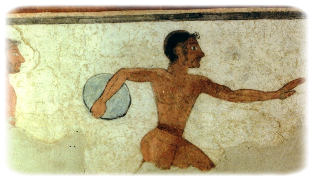 That he became fast friends and associates with the Dionigi family, whose name is emblazoned prominently on Peter’s balloon, which he boasted is the largest in Italy, is just the sort of good fortune that seems to happen often in Umbria. Peter’s Germanic roots were apparent from the moment we met him in the field where our balloon was being prepared for its flight. Against a backdrop of the enormous mongolfiera, he barked commands to our group of 16, barking at us to stand here, to stay away from that, to get ready to board the basket and how we would brace for landing. 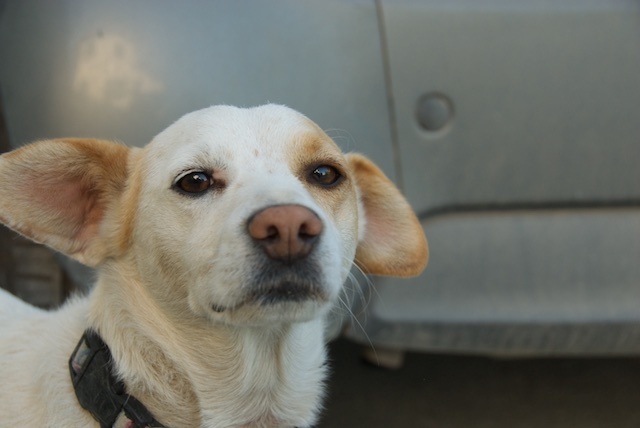 His bark turned out to be much worse than his bite, however, as he punctuated his necessary commands with humor and grace. By the time the balloon was fully inflated and we had scrambled aboard the basket, it was clear to all that our pilot was in control of the balloon, its passengers and the situation. He admonished us not to worry about anything. Unless he seemed worried. 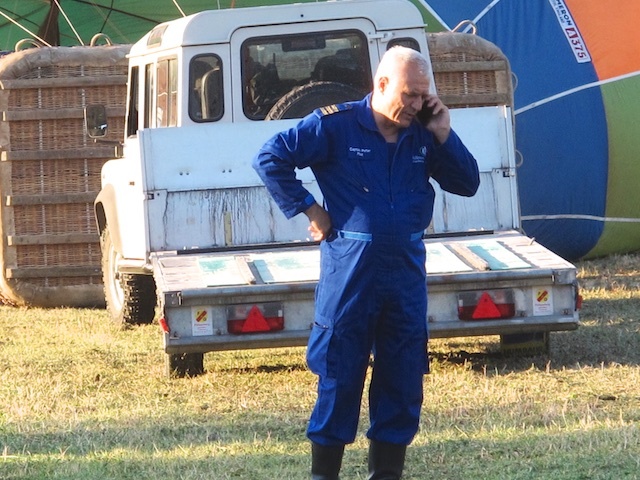 And with a few revs of the engine – well, rather a few bursts of flames from the ignitors that Peter constantly used to replenish the balloon with hot air – we rose, slowly, gently and peacefully from the field. 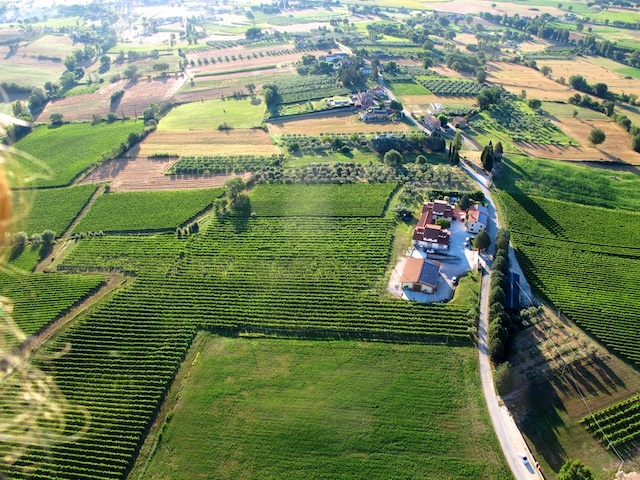 Until we could look down directly on Peter’s hangar, his house and Roberto’s expansive fields of sagrantino, merlot and grechetto. Until we were a thousand feet high and were able to see across the valley to the beautiful glimmering cities of stone that dot the mountainside – Assisi, Spello, Trevi, Spoleto. Until we reached two thousand feet, floating languorously in the cool morning air, the golden yellow sunlight bathing the hills as a patchwork of vineyards unfolded below us, giving way to the hilltop Etruscan beauty that is Perugia and the small shimmering outline of Lago Trasimeno in the distance. We topped out at three thousand feet on a day that Peter described as “too perfect,” a morning so completely windless that steering the balloon through the usual air streams that pilots ride to bring them to their landing spot did not exist. And so our pilot cut short our adventure, expertly guiding us into a field just below another of our friends’ wineries, coming to rest among a grove of olive trees. The property owners, startled to see an enormous balloon descending into their grove came running to give us assistance, but the only help Peter needed was for them to show him a route that his Land Rover and trailer could take into the grove so we could pack the balloon and basket and take our group back to the Cantina. After deflating and packing the balloon we were transported back to Roberto’s winery, where our group was treated to a fabulous breakfast of fruits, sliced meats and cheese and Roberto’s Grechetto, Montefalco Rosso and Sagrantino wines, served, of course, after the obligatory glass of champagne or prosecco that marks every successful return to earth of the balloon and its passengers. In the gleaming, new Dionigi tasting room, with its unmatched view of the val d’umbria and Assisi and Spello, we bonded with our fellow passengers, shared our reactions to the unforgettable views and the experience of seeing this land, which we have seen so many times from ground level, from a new and truly wondrous vantage point. 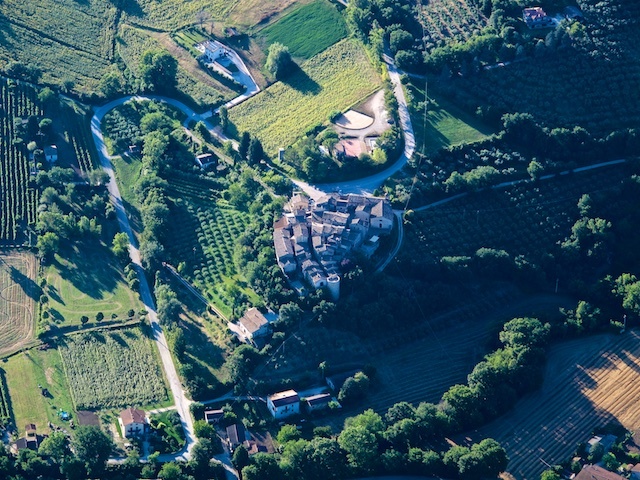 Umbria is known as “the green heart of Italy” and its majesty is well apparent to all who wind along its wandering lanes, who hike its gentle slopes, who explore its jewel like hill towns. To take all of this in from above, however, to drink in its panorama a full three hundred and sixty degrees, floating along on the soft morning breeze like a feather in the wind, is a truly unforgettable experience. 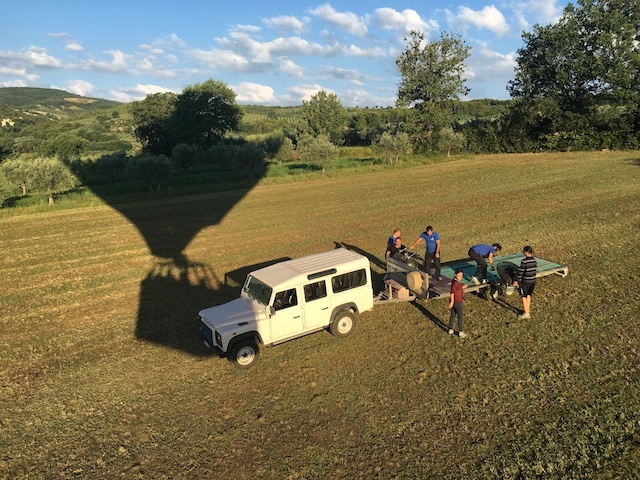 For more information on Balloon Adventures Italy or to book your own aerial adventure, contact Eleonora at +39 366 314 0558 or email info@ballonadventures.it. Visit their website at www.balloonadventures.it. I have been vaguely aware of the existence of an Italian game from the countryside called ruzzolone for some time. I don’t know where I first heard of it, but I wish I had heard about it sooner. Lucky me! About a year or so ago, while doing a google search on a particular winemaker we wanted to learn more about I came across his image in front of his winery. 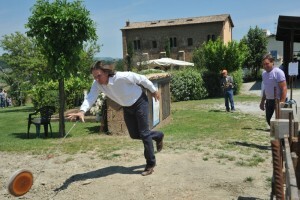 In the picture Giovanni Dubini was launching a huge wheel of cheese down a dirt path. With a few admirers cheering him on. This was Giovanni playing ruzzolone. The image of this sophisticated winemaker joyously playing farmers’ game captured my imagination and made me want to learn more about the game. For the past year or so I have been joking with Albertino Pardi that I wanted to learn all about ruzzolone and transport the sport to America. 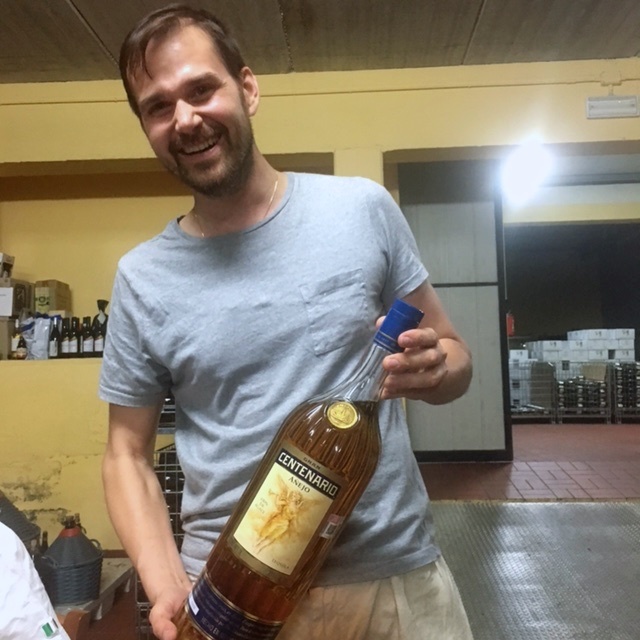 Albertino, whose family owns and operates the Cantina Fratelli Pardi winery and who is a friend and colleague of Giovanni started my ruzzolone education on the spot, teaching me all that he knew about the sport, an ancient game that by some accounts traces its roots back to Umbria’s Etruscan forebears. 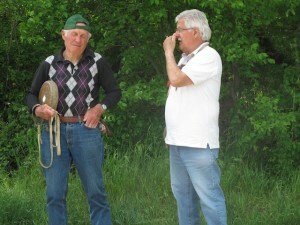 Despite its origins, though, it is a game that was made for the country, for rustic folks, for Umbria. Ruzzolone is the answer to the question, “how can I entertain myself if all I have is a wheel of cheese, a belt and a country road.” The sort of question that no doubt comes up often in rural Umbria. Today’s modern game has substituted a standardized wooden disk for a wheel of cheese (which no doubt was too valuable to waste on sport), but still uses just a cloth strap and a country road. 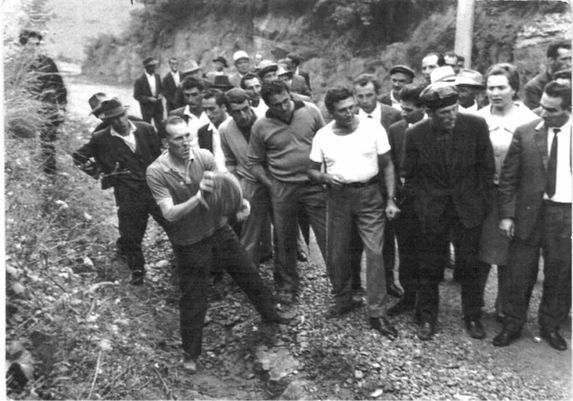 Players wind the cord around the disk and rock back and forth several times in a stylized, ritualistic windup before heaving ho in a motion not unlike a professional bowler, but putting all manner of English on the delivery of their disk to enable it to curve around corners, hug the edge of the road and, as is the object of the game, travel the farthest distance possible. And how it does travel! On a good throw for hundreds of yards, wending its way around curves, ricocheting off of hillsides, rolling ever forward for upwards of 20 to 30 seconds. There seems to be no dress code for participants, save dark clothing and caps. Shaving seems to be optional as well. Grunting, so loud and baying that it would put Maria Sharapova to shame is looked upon favorably as is the occasional uncontrolled spewing of obscenities and invective as the disk deviates from its flight plan and launches itself into a nearby field or up a bank into a thicket of trees. But what a way to pass an afternoon. 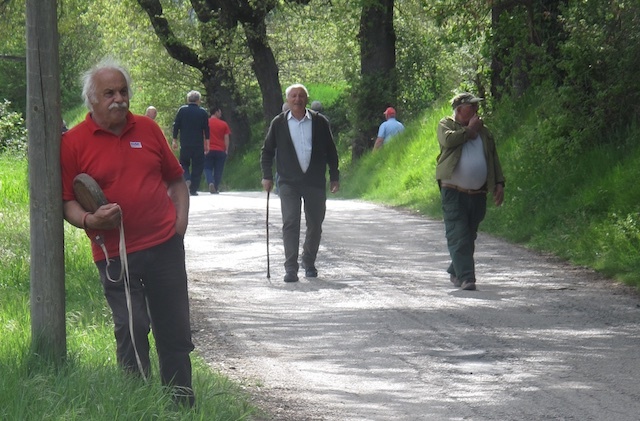 Especially on a beautiful spring afternoon as Albertino, his wife Jessica, his brother Gianluca and father Alberto and I did recently along a quiet country road outside the ancient borgo of Castel Ritaldi. Grunting aside, the only sound was the occasional disk clacking along the rough asphalt, eventually coming to a halt with a bang when colliding with the makeshift barriers erected along the course or with a wobble as it lost momentum and simply rolled over. If the sport of golf is sometimes described as “a good walk spoiled,” ruzzolone is a good walk made even better. No wonder country farmers live to be 100. They drink lots of red wine, eat pork fat and walk along country roads with their friends, playing a game that Seinfeld could have invented. After watching (and even trying my own hand at it) I am convinced my instincts were right a year ago when I vowed to Albertino that I was going to bring ruzzolone to America. Ruzzolone may be just what we need.